This part of the cycle looks quite favorable for office. All of the key areas of the market are improving; absorption is up, supply remains under control in aggregate, rent growth is accelerating, and investors continue to allocate capital to the sector. That being said, there is still plenty of room to run. The recovery is only halfway through, after all. Exhibit 1 compares two key aspects of the office recovery: the number of office submarkets with improving fundamentals (blue line) and the number of markets that are back to previous cyclical occupancy peaks (orange line). They tell two complementary stories. 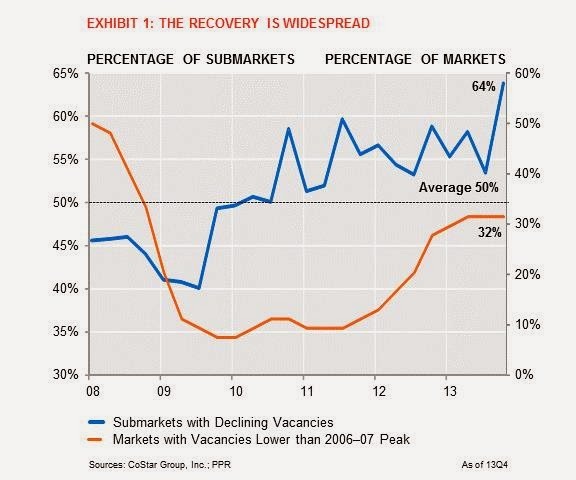 While more submarkets are experiencing recovery-64% in the fourth quarter of 2013, the highest rate of the recovery-only a few markets have regained their previous high-water mark for occupancies (32%). So while an improving vacancy rate in a hard-hit housing-bust submarket is certainly good news, there is still a long way to go. And in fact, that is great news-value-add plays are still viable and offer investors continued opportunities as the market cycle matures. For companies seeking to sell, purchase or lease office space in Jacksonville, please contact Chip Sistare at 904-421-8546. Investors and owners of office properties can count on the property management services of Benchmark Asset Services.